Please, be informed that the next NOUN convocation comes up January 2019. 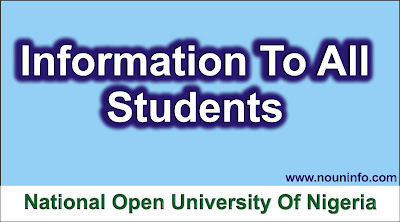 All eligible graduands are therefore requested to go to their study centres with their course registration slip(s) that has proof of IT and PROJECT registration for the ongoing NOUN clearance exercise for final students. Below are the NOUN graduation requirements and clearance procedure. Do read carefully and follow-up accordingly. Click on the *Study* *Centre* to clear any issues regarding the centre. If there are none, an official stamp is required here for proof. Click on *library* for clearance on books if still having school books in your possession. If there are none, an official stamp is required here for proof. Click on *bursary* ; here is the final process for clearance on Alumni, project fee, IT, etc. This part will also be stamped by the faculty representative. Having satisfied all the above, the student is ready for the graduation ceremony. That's a total of *N22,500* is required for this exercise. All NOUN Graduating students, especially those whose name are on the New Website, must print out their E-Wallet from their portals. Students that registered Projects before January 1st, 2014, with 10,000 are free. But those that registered Project with 10,000 after the above date, must pay a balance of 5,000. Any student with a Negative balance in the portal must clear the balance before he/she can be cleared. All Graduating Students must pay CONVOCATION and REGISTRATION FEE of 15,000. Upon return of the Gown in good condition within the stipulated time, a refund of 5,000 will be made to the student into the student's bank account. The payment of the 15,000 should be strictly for the CONVOCATION and REGISTRATION vis REMITA website. *5* Description: Type your reason for payment (CONVOCATION and REGISTRATION FEE). If you ate paying for any other item: Project Balance or Result Verification or Jamb Regularization, etc,. You state it there. *10* Take your RRR to any commercial Bank for payment. The above convocation fee payment procedure can be done for you at your study centre Business office, whereas Graduation Clearance is done at your study centre Accountant Office.